There is a strong case for extending the comprehensive ideal beyond 16, even to university. We persist in describing our sixth form college as comprehensive when the term has been unfashionable for some time and there is no requirement to have inclusive admissions policies. We are proud to be comprehensive and, for us, using the “c-word” is the clearest way of defining one of our core values; the fact that we aim to provide for the educational needs of all young people in the age group we cater for, ie: 16-19 year olds. However, this is not the norm. The case for a comprehensive post-16 college still needs to be made given that there is such a wide range of potential courses available at different levels for this age group and also that 16 year olds have complete freedom of choice about where they study. Sixth form education has become the new frontier for selection with a plethora of new providers, whether 11-18 academies or 16-18 free schools trying to outdo each other in setting ever more exclusive entry requirements. Post-16 performance table measures and cheer-leading from the media and politicians encourage this selective bubble. Those schools and colleges which aren’t trying to be comprehensive should be asked: Why segregate? What is the case for exclusion? After all, a comprehensive intake is the norm for primary schools, why should things change after 11 or 16? 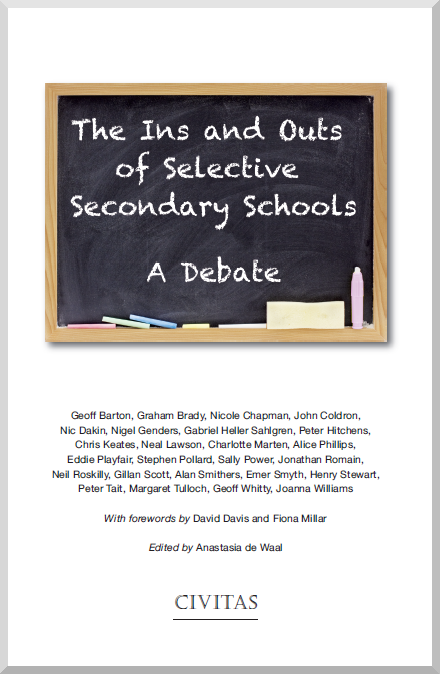 Faced with a proliferation of selective post-16 providers, we should be asking: Why is it OK for a school to be comprehensive from 11-16 and become selective in the sixth form, thereby excluding most of its former students? Why don’t you provide the non-facilitating A-level subjects many students want? Why don’t you offer the vocational courses which help so many students progress to university? Why don’t you offer the foundation and intermediate courses which provide vital stepping stones to advanced study for so many students who did less well at 16? The range of courses and specialisation available post-16 do require a larger system or network of providers to provide them cost-effectively but there is no reason why all these courses can’t be offered within a single institution or even under one roof. Because they operate in a market where students choose where to study, this doesn’t mean that the post-16 providers have to be either ‘niche’ or selective. Beyond this, the case for the comprehensive university has yet to be fully articulated. Why set a 50% ceiling on the proportion of the population who can benefit from a university education and tell some young people that university is not for them? Why shouldn’t publicly funded universities be tasked with leading a renaissance in lifelong learning with the aim of engaging all adults in some form of tertiary education, whether at postgraduate, degree or pre-degree level? The modern Conservative party has moved away from a full political endorsement of selection at 11 while nevertheless tolerating existing selective systems and practices where they exist. The right-wing populists of the UK Independence Party (UKIP) seem to have taken on the mantle of champions of selection, advocating ‘a grammar school in every town’ and therefore ‘3 or 4 secondary moderns in every town’. If academic selection and the 11+ are back on the political agenda then they should certainly be vigorously challenged. Many of us will want to defend the comprehensive principle because we believe that the common school, college and university, like the NHS, are part of the foundations of the good society. New Labour was squeamish about the ‘e-word’ preferring to substitute ‘fairness’ or ‘equity’, perfectly good concepts in themselves but the change of language appeared to signal a dilution of Labour’s commitment to actually challenging inequalities even of the grossest kind. Perhaps it is time for the party to give English education its ‘NHS moment’ and apply an egalitarian litmus test to its thinking about publicly funded schools and colleges. Labour might even find that this plays well with an electorate fed up with the 57 varieties of segregation we are currently experiencing. The comprehensive school is a successful and popular expression of solidarity which transcends all social differences. The idea that children and young people should be educated with their neighbours and their peers in a learning community which reflects the composition of the geographical community they live in is still valid, even if some have abandoned it. A comprehensive system discourages competition for positional advantage by school, and seeks to ensure that every school and every student can flourish. There is a considerable body of research into the performance of selective systems compared to comprehensive ones. Chris Cook’s analysis7 of GCSE achievement for 2011 in selective and non-selective areas in England demonstrated that students from poorer backgrounds and the bottom 50% did significantly worse in selective areas while the wealthiest 5% did better. The Sutton Trust report Degrees of Success8 suggested that given their intake “grammar schools would appear to be under-represented among the most successful schools for Oxbridge entry.” An OECD report has shown that the top 5 education systems as measured by the Programme for International Student Assessment (PISA) are non selective9 and comments that “early differentiation of students by school is associated with wider than average socio-economic disparities and not with better results overall”. Recent research by Matt Dickson, Lindsey Macmillan and Simon Burgess10 also demonstrates that selective systems increase inequality; lowering incomes at the bottom as well as raising them at the top. Students can and do achieve outstanding results in comprehensive settings and there is no evidence that selection increases most students’ chances of success. Quite the opposite, selection restricts opportunities for achievement and increases social segregation. We still live in a class-ridden society and this is reflected in the classification, hierarchy and competition between providers in education as in so many other areas of our life. Our understandable desire for an education which helps us or our children ‘get on’ is translated into a striving to find the ‘best’ school or college, often with diminishing returns. We are obsessed with the pecking order rather than being obsessed with education and flourishing. So what does a genuinely egalitarian approach look like in relation to education? It means rediscovering and proudly championing the virtues and achievements of universal public services. The comprehensive school or college is a place where citizens experience equality. People are treated with equal respect, meet and work with others on equal terms and have their individual needs met regardless of their starting point or ability to pay. It’s time we saw our successful comprehensive schools and colleges as the benchmark even if they don’t top the performance tables for raw exam scores. By doing a great job for all students, they pose a daily challenge to more selective providers to justify segregation. It is the advocates of more selection who need to explain what their proposals are for the education of all those students they keep out. Surely they should be raising their game rather than simply picking the low-hanging fruit? Like other public services at their best, state-funded education providers model the social relationships of a more equal society. As Basil Bernstein rather depressingly reminded us: “education cannot compensate for society” 11 nevertheless the fact that people’s experience of equality in one sphere is not mirrored in every other aspect of their day to day experience should be a source of anger and action rather than a reason for giving up on the egalitarian ideal. People clearly do not all engage with education from the same starting point and many face enormous barriers. However, the right kind of public education can challenge injustice and give people a lived experience of more equal social relations and practices so it is worth trying to compensate for society. Schools, colleges and universities for everyone are better placed to promote excellence for everyone. The challenge is to renew and reshape the comprehensive system rather than abandoning it. Selective schooling systems increase inequality, Simon Burgess, Matt Dickson and Lindsey Macmillan, Institute of Education working paper, May 2014. Basil Bernstein, New Society 15 (387), 1970. This entry was posted in Education policy and tagged Colleges, comprehensive education, Education, education system, Equality, schools, selection, Sixth form college, Social cohesion, Social mobility. Bookmark the permalink.